You've seen those distinctly-Jewish prayer shawls draped over men engaged in fervent prayers. The white fabric envelopes them while standing out in a crowd. They are hard to miss. The tallit. The ancient garment whose purpose is to allow the religiously observant man to perform the commandment of wearing tassels or fringes upon their clothing. Less visible is the version known as the tallit katan, the poncho-like undergarment that also allows the commandment to wear tassels to be performed, but in an all-day setting, and not just for prayers. Scripture is very plain as to how this command is to be lived out, and also as to why the command is to be performed. And YHWH spoke to Moshe, to say, "Speak to the sons of Yisra'El, and say to them that they make for themselves fringes upon the corners of their garments for their generations, and that they place upon the fringes of the corner a cord of blue. And it shall be for you for a fringe, and you shall see it, and you shall remember all the commandments of YHWH, and you shall do them. And you shall not search after your heart, and after your eyes, which you go whoring after, so that you shall remember, and shall perform all of My commandments, and you shall be set apart for your Elohim. It is explained as simply as possible in the text how and why we are to perform this commandment. It could not get any easier than this. The only issue present is what is the purpose behind this particular application? What is the reason for using fringes/tassels attached to a four-cornered garment to help us remember the commands? Upon the surface text, the tassels don’t readily appear to have a clear reason that connects them to remembering to do His commandments. It almost seems arbitrary that it was tassels which were chosen to help us remember the commands. The people would have already been wearing the frontlets upon their head and hands, as well as writing the commandments upon their doorposts, in some fashion akin to the modern mezuzah, so how would the presence of fringes be of any more help when it comes to remembering the Word of the Holy One? Just as the purpose of the mezuzah is different than the purpose of the head frontlet, and the hand frontlet’s purpose is also different from the head, so too is the purpose of the fringe different in application than these other two “remembrance” commandments. They all share the common theme of being done to remember His Word, but each one contains nuances that are particular to that specific command, and so benefit can be derived from our performance of them all. What may appear arbitrary at first glance in Scripture is always filled with wisdom when we delve deeper into it. Nothing is done simply for the sake of doing it, but rather contains a wealth of significance backing it up. All that is required to understand the decision to place tassels upon the four corners of our garments is to look deeper into the Father’s Word and attempt to see the scattered connections which congeal into a unified whole and allow us to see the great wisdom of the Holy One for His chosen people in the world. In order to do this, let us take a closer look at the details of the command to wear tassels upon the corners of our garments. Firstly, let us consider the word “corner” used in the above verses from Numbers 15. The word used is KANAF, and literally means “wing.” Of the four different Hebrew words used for “wing” in the Hebrew Scriptures, the term KANAF is the most extensively-used one. Over and over again one can do a search and find that it is implemented in passages all over Scripture as “wing.” The image provided shows the Paleo-Hebrew and modern Hebrew scripts for the word KANAF. And YHWH spoke to Moshe, to say, "Speak to the sons of Yisra'El, and say to them that they make for themselves fringes upon the wings of their garments for their generations, and that they place upon the fringes of the wing a cord of blue. And it shall be for you for a fringe, and you shall see it, and you shall remember all the commandments of YHWH, and you shall do them. And you shall not search after your heart, and after your eyes, which you go whoring after, so that you shall remember, and shall perform all of My commandments, and you shall be set apart for your Elohim. If we approach this passage now with the clarity of understanding that the literal definition of the word normally translated as “corner” is really saying “wing,” then it opens up a much different presentation of the commandment to wear fringes. Our garment itself is transformed from just being a mundane piece of clothing to being considered as possessing wings! In that, we are commanded by the Holy One to place a fringe upon our wings. While it may not at first make any logical sense to wear a garment with four wings in our desire to obey His words, as we go further into the witness of the Word, the connections will be made and we shall see the wisdom of the Father in this interesting commandment, and how we are to apply it in our lives in such a way that not only brings glory to Him, but also brings eternal purpose to ourselves. Upon the "wings" of our garments are to be placed "tassels" / "fringes." The term used for this particular word is the Hebrew word TZITZIT. For those unfamiliar on how to pronounce it, the TZ sound is identical to how the ZZ is pronounced in the word PIZZA, and thus, the end result is TZEE-TZEET. It is looking into the meanings behind this one term that allows us to begin to see how the tassels are supposed to function in our lives, and why He chose for fringes to aide in remembering and doing His commandments. This word itself has a few different meanings that hold significance for us. In this alternate meaning we begin to see the relation to the function of the fringe: in that the word comes from TZITZ, a term that denotes a blossom or a flower, we can ascertain that the tassels are linked with us being fruitful, alive, growing. We are not to become stagnant or dead in our good works, but are to pursue the commandments of our King with much desire and an ever-growing sense of obedience to His voice and way. The command is to look upon them and not be led astray to do our own desires, which shows us we should be fruitful in our walks. The second meaning of the word TZITZ is "ornament" or "diadem," and is the term used for the golden plate upon which the Father’s holy Name was engraved that was worn by the high priest, as found in the book of Leviticus 8:9. The plate upon his head conveyed the idea of devotion and consecration to the Most High. The wearer was to be constantly mindful of his high duty, and was not to swerve to the right or to the left. The TZITZIT are to function in this same manner. They are to serve as reminders of our covenant-status of devotion to the things of Elohim. Notice that it does not say that they lengthen their tassels, but that they lengthen the "blue cord" of their garments. It is not the fringe itself that was the issue, but perverting the purpose of the ribbon of T'KEYLETH blue that is commanded from the Torah to be placed in each tassel. The Aramaic word is actually a cognate of the original Hebrew. The normal understanding taken from the Greek of this passage tells us that Messiah was speaking against lengthening the TZITZIT in general, which is honestly somewhat subjective of an interpretation for each individual, since “short” to one person could still be “long” to another, but the Aramaic text actually tells us He was against grossly abnormal lengthening of the blue cord in the TZITZIT, which is exactly what we find is commanded to be done in the traditions of Rabbinic Judaism! So, from the Aramaic, we can see that this practice of drawing attention to one’s self through an alteration of the pure commandment was already taking place even back in Yeshua’s days! The image below displays several different types of accepted traditional styles that do not just fulfill the commandment, but are intended to be a statement that the wearer is a follower of a specific rabbinical teacher or interpretation or sect, and not just performing the commandment in accordance with the Word. While such creativity in performing a commandment that does not initially prohibit the exercise of it is not in itself an error, the use of that creativity to single one's self out as the follower or adherent of a specific sect over and above the pure performance is indeed a problem of the heart that is revealed in the physical, and is what Messiah was speaking to by His calling out the lengthening of the blue cord by the Pharisaical sects, which is undoubtedly necessary to an extreme if making such versions for purposes of declaring a sectarian statement. These two alternate definitions of the word TZITZ help us to see the wealth of meaning that was intended originally in the usage of that term for tassel. We are to be bearing fruit, blossoming, bringing life in our walks wherever we go. We are also to wear them as a sign of devotion to the Holy One, of a focused consecration that reminds us of our ministry of reconciliation, and not in such a way that causes others to place their attention abnormally upon us, but rather upon the One who is working in and through us. However, there is yet another definition of the word TZITZ that needs to be addressed, and begins to pull the whole study together. The third definition of the word TZITZ is different in application to the preceding two words, and has the very curious meaning of “feather.” This particular definition is somewhat strange, admittedly, but there is a good reason for pointing this out in this study. You might very well wonder what exactly this meaning of the word has to do with anything, but it really fits perfectly in with the placement of the fringes upon the garment. The Hebrew, if you will recall, tells us that we are to place the TZITZIT upon the corners of the garment we wear, or more literally, upon the wings of the garment we are to wear. And so, upon those wings are placed a TZITZ -- a feather! And YHWH spoke to Moshe, to say, "Speak to the sons of Yisra'El, and say to them that they make for themselves feathers upon the wings of their garments for their generations, and that they place upon the feathers of the wing a cord of blue. And it shall be for you for a feather, and you shall see it, and you shall remember all the commandments of YHWH, and you shall do them. And you shall not search after your heart, and after your eyes, which you go whoring after, so that you shall remember, and shall perform all of My commandments, and you shall be set apart for your Elohim. And I looked, and behold, a tempest wind came from the north, a great cloud, and from it was taken fire, and splendor was around it, and from its midst was as an eye of brass from the midst of the fire. And from the midst, the likeness of four living beings. And this was their appearance; the likeness of a man was to them, and four faces were to each one, and four wings were to each one of them. Also, all of Ezekiel chapter 10 speaks further of this purpose of these particular angelic beings, which the reader can look up and read on their own, for the sake of space here. And from above the expanse which was upon their heads was as the appearance of a stone of sapphire; the likeness of a throne. And upon the likeness of the throne was a likeness as the appearance of a man upon it, from above it. And Moshe went up, and Aharon, Nadav, and Avihu, and seventy from the elders of Yisra’El, and they saw the El of Yisra’El, and under His feet as a worked pavement of the sapphire, and as the essence of the heavens for purity. Here we see that in the Presence of the Most High was a stone-work that appeared to be made of pure sapphire. This is significant also because this is the only type of stone that is mentioned on Mount Sinai, and is uniquely in the presence of the Holy One. Furthermore, just a two verses later, in Exodus 24:12, the Holy One tells Moshe that He would give Him commandments that are written upon tablets made out of stone. The ancient Jewish tradition has long been contended that the tablets of stone given to Moshe were sapphire stones, engraved with the commandments from the Holy One. If you ever heard of such a tradition, and wondered why that view is held, you now can see that it is assumed based entirely on the nuanced details contained in Scripture itself. The only stone mentioned by name upon Sinai is the sapphire stone, and it is the stone that is spoken of as being present when the Holy One was also present, and Moshe is then given two tablets made out of stone. Therefore, the relation exists between the color of the sapphire stone to the commandments, as well as the Presence of the Most High, and the angelic beings with four wings, which relates us back to the fringes and their own cord of blue, the purpose of which is to remind us to perform the commandments given to Moshe upon Mount Sinai! I believe there is a relation here that shows us the purpose of our performance of this commandment to wear tassels. Look carefully at the images on the right: the left side shows cords of T'KEYLETH blue for use in the fringe, and the right side shows a piece of sapphire from Montana. Notice the untouched stone faintly holds what appears to be the Star of David! We are to bring the throne of Elohim to dwell in the earth, so to speak. By our performance of the commandments, by our adherence to His covenant, we remain focused and on track to His goal of desiring to dwell with mankind in the earth. We are to uphold the throne of Elohim in this world by our following His instructions from the Word. By performing His Word, which is His will, we help prepare this place for His coming to tabernacle with mankind. Thus, the purpose of the garment with the TZITZIT is to in effect show us what we are to be doing -- we are to serve essentially as keruvim in the physical world. We are to clothe ourselves with wings and feathers, and the interconnecting blue thread through our lives is the desire to bring the throne of Elohim to the earth to rule all men! 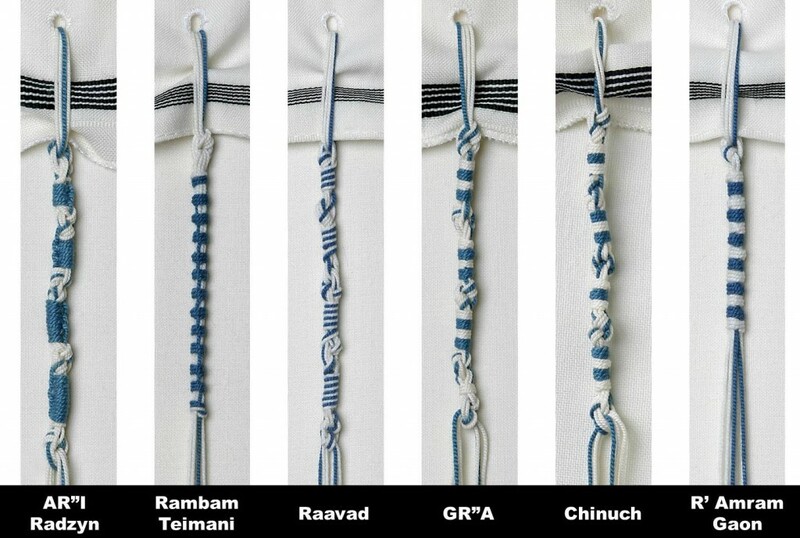 The physical four-cornered TZITZIT garment is meant to allude to our spiritual status of the throne-bearers of Elohim in this world! We are to be focused and on track, close in our relationship with the Father, in order to display, to the best of our ability, His heavenly throne here on the earth.